The way the QuickBooks integration works is, once integrated everything should be entered into Workshop Software. Make sure you do not have a duplicate of the customer in both systems - otherwise your customers and or suppliers will double up in both systems. Invoices for both customers and suppliers will only flow from Workshop Software to QuickBooks, this includes customer invoices and payments as well as supplier invoices and payments. You will need to have either have the ‘Essentials’ or ‘Plus’ package for the integration to work. No invoices previously done in QuickBooks will flow over to Workshop Software. No invoices previously done in QuickBooks will flow over to Workshop Software, only new invoices created in Workshop Software will be integrated into both systems. This means that if you have previous data in QuickBooks, that will only remain in QuickBooks for your records. Parts do not integrate from QuickBooks into Workshop Software and they are not tracked via QuickBooks, only Workshop Software. We can import parts once exported from QuickBooks into Workshop Software. Please contact support@workshopsoftware.com for importing assistance. What do the QuickBooks accounts mean? *This information relates to the initial integration of QuickBooks. It will ask you to choose an account, this is where the sales or expenses will appear in QuickBooks. The type of accounts are listed below - you may have as many accounts as you like as long as they are the correct 'type' to match with Workshop Software. 1. Labour Sales Account – Type of account needs to be ‘Income’ and the details type needs to be ‘Sales of Product Income’. 2. Stock Sales Account – Type of account needs to be ‘Income’ and the details type needs to be ‘Sales of Product Income’. 3. Consumable Sales Account – Type of account needs to be ‘Income’ and the details type needs to be ‘Sales of Product Income’. 4. Accessories Sales Account – Type of account needs to be ‘Income’ and the details type needs to be ‘Sales of Product Income’. 5. Tyre Sales Account – Type of account needs to be ‘Income’ and the details type needs to be ‘Sales of Product Income’. 6. Sublet Sales Account – Type of account needs to be ‘Income’ and the details type needs to be ‘Sales of Product Income’. 7. 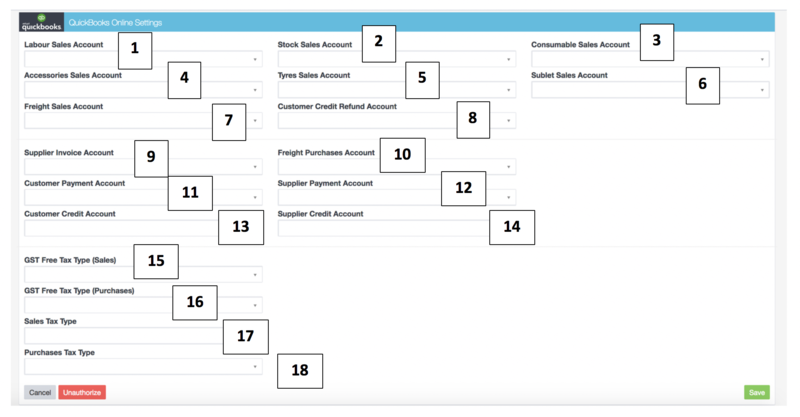 Freight Sales Account – Type of account needs to be ‘Income’ and the details type needs to be ‘Sales of Product Income’. 8. Customer Credit Refund Account – Type of account needs to be ‘Cash and cash equivalents’ and the details type needs to be ‘Cash and cash equivalents’. 9. Supplier Invoice Account – Type of account needs to be ‘Cost of Sales’ with the details type being any of the available selection. 10. Freight Purchases Account – Type of account needs to be ‘Cost of Sales’ with the details type being any of the available selection. 11. Customer Payment Account – Type of account needs to be ‘Cash and cash equivalents’ and the details type needs to be ‘Cash and cash equivalents’. 12. Supplier Payment Account – Type of account needs to be ‘Cash and cash equivalents’ and the details type needs to be ‘Cash and cash equivalents’. 13. Customer Credit Account – Type of account needs to be ‘Cash and cash equivalents’ and the details type needs to be ‘Cash and cash equivalents’. 14. Supplier Credit Account – Type of account needs to be ‘Cash and cash equivalents’ and the details type needs to be ‘Cash and cash equivalents’.